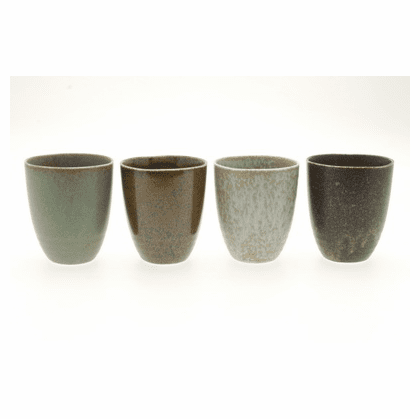 Set of Four Pacific Forest Matte Ceramic Tea Cups 8 oz. Home | Ceramic Teapots & Tea Cup Sets | Ceramic Tea Cup Sets | Set of Four Pacific Forest Matte Ceramic Tea Cups 8 oz. Handcrafted in ceramic tea cups. Each with a different glaze and colors may vary from those pictures. 3-1/2" tall, 3-1/8" in diameter. Capacity: 8 oz. Come in a gift box.